It can take a long time to upload images to a website or send an email with lots of images attached. To save time uploading files it is a good idea to resize images first on your computer and then upload or attach the smaller files. Bigger websites like Facebook and Flickr will do this for you on your computer without you really knowing but in other cases you will need to resize the files first yourself. 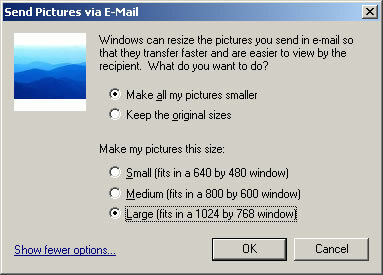 Download the Windows XP Power Tool Image Resizer which adds a resize option when you right-click on a file. Utilise the E-mail this file feature that gives you an option to resize and save images – with the images resized the email can be discarded. Microsoft provides a tool that makes resizing images really simple. 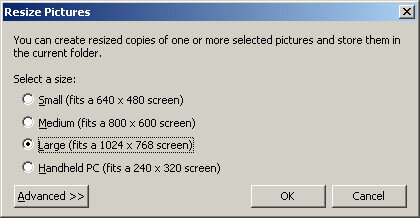 The Image Resizer download is available on the Windows XP Downloads page under the Power Tools tab. Download and run the Image Resizer installer following the installation instructions. The Large size is probably the best option but you can use the smaller sizes instead. The Advanced button allows you to enter custom dimensions and gives you some other options too. Using the default options resized images will be created as new files in the original folder and will be given a new name. When resizing images it is best to keep a backup copy of the full size image somewhere else. Select the Large option for the image size and press OK.
Now you can specify where the resized images are saved. 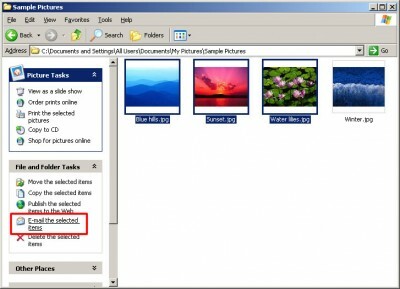 If you create a subfolder called resized in the original location it will be easy to find the resized images later. With the images saved the email window can be closed (or you can email the resized images). The resized images will now be considerably smaller in file size and so will be faster to upload to websites or attach to an email. This entry was posted in Tutorials and tagged Windows. Bookmark the permalink. Post a comment or leave a trackback: Trackback URL.